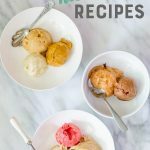 Frozen bananas pulsed in the food processor turn in to dreamy, creamy, vegan ice cream! 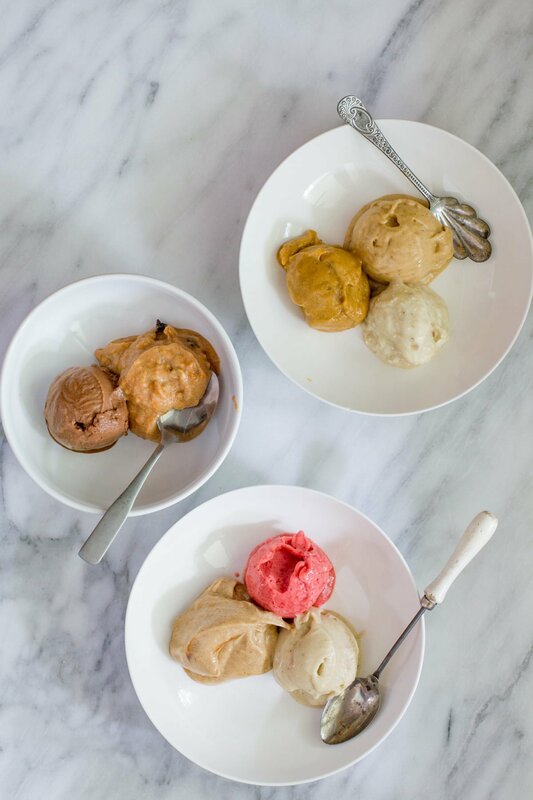 Check out these 8 vegan banana soft serve recipes! 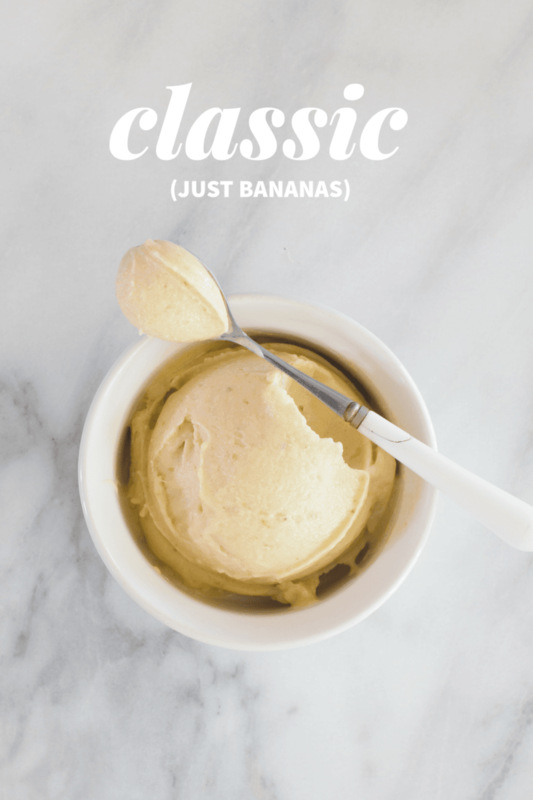 Call it banana soft serve, call it “nice” cream, call it vegan ice cream—whatever you call it, if you haven’t tried making banana ice cream at home, stop what you are doing right now and go put some bananas in the freezer! You gotta try this. If you’ve never heard of banana soft serve before, the concept couldn’t be any simpler. 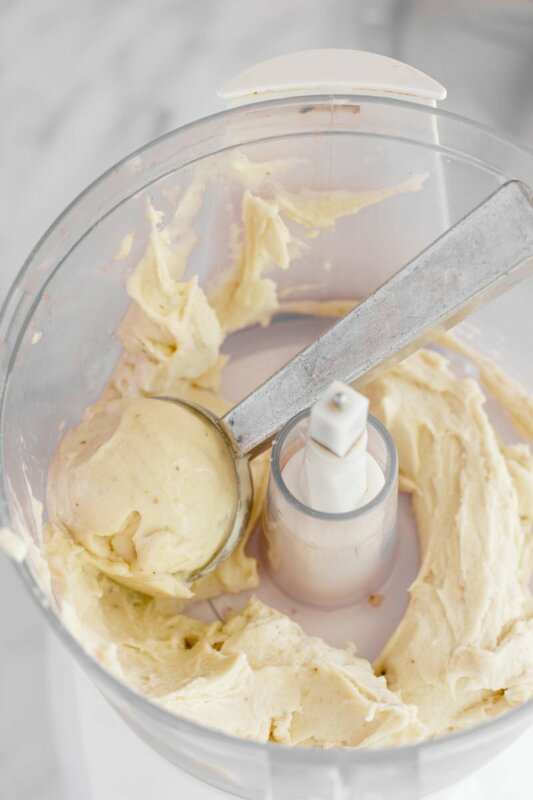 Freeze some banana slices, and then when they’re frozen solid, pulse them in a food processor until you get an end result that is almost exactly the same texture as soft serve ice cream—you’d never know it was only bananas! Banana soft serve is one of my favorite healthy summer treats—it’s literally just fruit—so I feel totally fine serving this “dessert” to my family all the time. We eat it for breakfast (it’s awesome on top of overnight oats). We eat it for a snack. We eat it for dessert. I don’t think there is anything wrong with a little bit of real ice cream every now and again, but when you’re looking for a healthier option to enjoy regularly, you can’t beat banana soft serve. 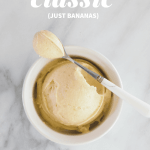 Banana soft serve is great classic style—just with bananas—but it also lends itself to being awesome with all kinds of mix-ins. 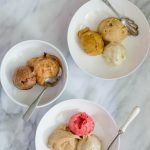 I partnered up with my friends at Musselman’s Apple Butter to bring you eight awesome ways to enjoy banana soft serve. 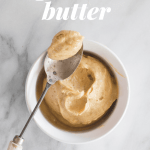 Musselman’s Apple Butter is a great way to add moisture, flavor, and sweetness to all kinds of recipes—including your banana soft serve creations. 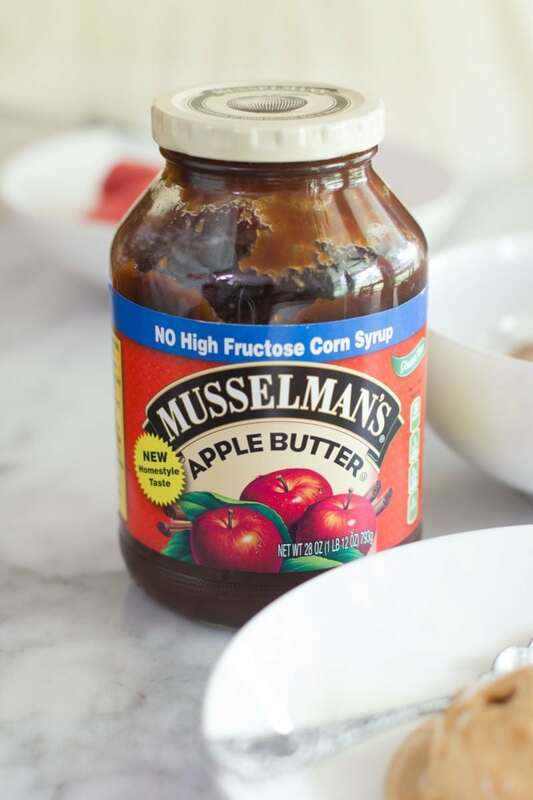 I love that Musselman’s has no high fructose corn syrup and only three ingredients—apples, sugar, and spices. It’s exactly how I’d make apple butter at home if I could find the time in my schedule to go pick apples, peel them all, and make apple butter (maybe one day). For now, I rely on Musselman’s! Before we dig into the eight banana soft serve recipes, I want to give you a little bit of an overview of how to freeze bananas. For banana soft serve, you only want to freeze ripe bananas—green ones won’t taste right as ice cream. I avoid using too ripe bananas, too—they just aren’t my favorite. But if you like ’em, go for it! To freeze the bananas, peel them, then break or cut into small pieces (~1″ in length). Place the pieces in one layer on a baking sheet, and freeze until hard. Then transfer the frozen pieces to a large zip-top bag. I keep a bag of frozen bananas in the freezer at all times. They are great for soft serve, for smoothies, and for banana bread. Alright, onto the recipes! It’s really hard to believe that this is just bananas, but it is! 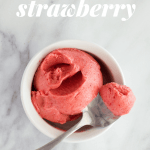 Not only is this a delicious treat for any day, but it’s also a good option for sore throats or unhappy tummies. Place frozen banana slices into the bowl of a food processor. Pulse until the texture resembles soft serve ice cream, about 3 minutes. You may need to scrape the sides of the food processor with a rubber spatula occasionally. Serve immediately. Prep time does not include time for freezing bananas. 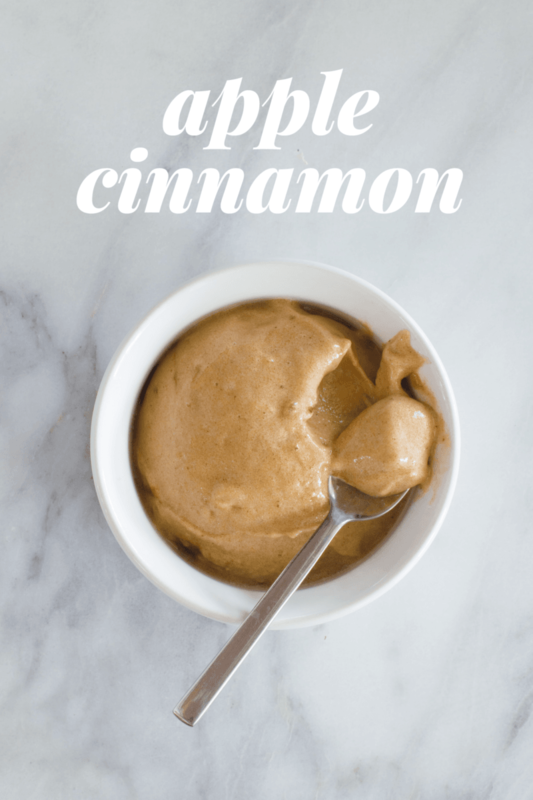 All the flavor of apple pie in a super healthy treat! 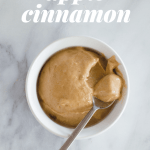 This one uses Musselman’s Apple Butter to give an awesome burst of apple cinnamon flavor. Place frozen banana slices into the bowl of a food processor. Pulse until the texture resembles soft serve ice cream, about 3 minutes. You may need to scrape the sides of the food processor with a rubber spatula occasionally. Add in the apple butter, vanilla, and cinnamon, and pulse until just combined. Prep time does not include time to freeze bananas. The chocolate and banana combo is classic for a reason—it’s super delicious! This is as close the classic ice cream flavor as you’re going to get. 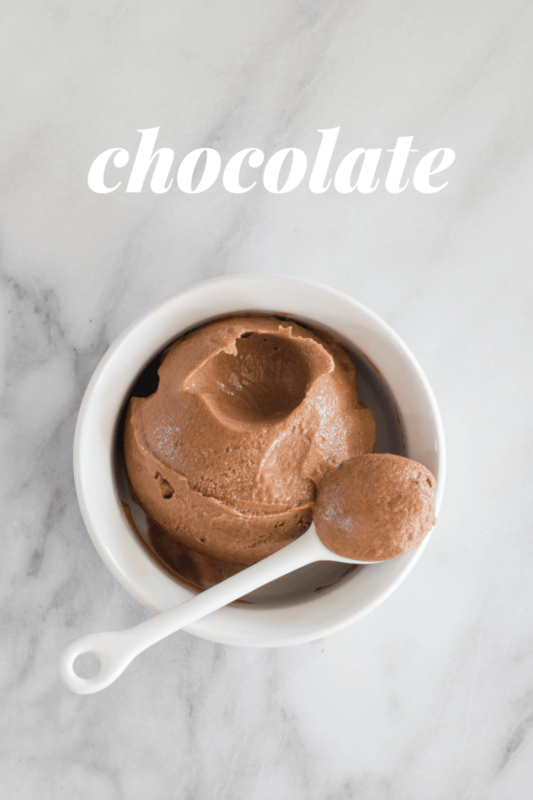 Place frozen banana slices, cocoa powder, and vanilla into the bowl of a food processor. Pulse until the texture resembles soft serve ice cream, about 3 minutes. You may need to scrape the sides of the food processor with a rubber spatula occasionally. Serve immediately. 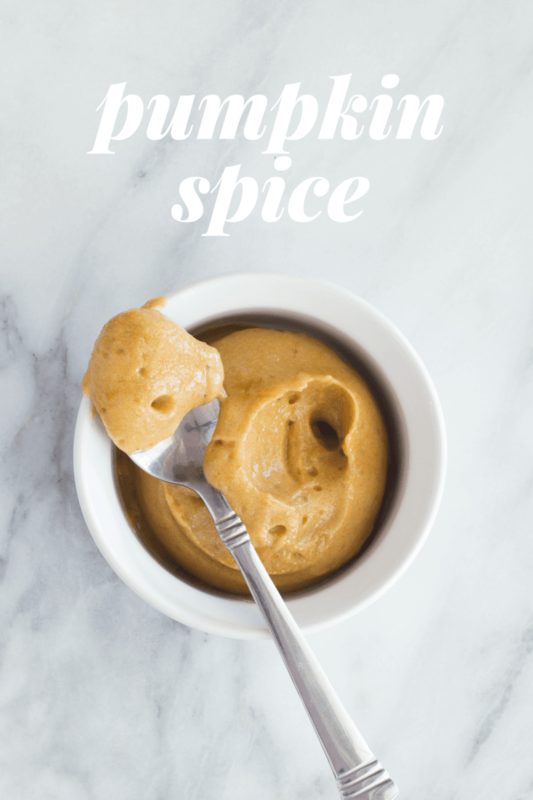 You know when it’s still 90 degrees outside, but you start to see pumpkin recipes on Pinterest? This recipe combines the best of summer and fall into one healthy treat! Lots of pumpkin pie flavor is added thanks to Musselman’s Apple Butter! 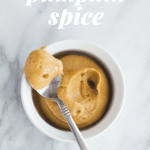 Add in the apple butter, pumpkin puree, and pumpkin pie spice, and pulse until just combined. Serve immediately, or freeze for 10-15 minutes to solidify. This banana soft serve has the most beautiful bright pink color! We keep frozen strawberries on hand at all times for smoothies and banana soft serve. 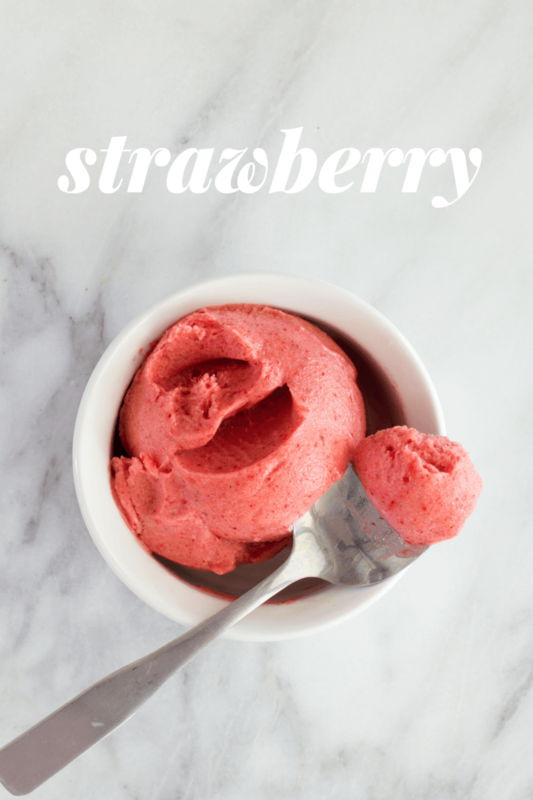 Place frozen banana slices, strawberries, and vanilla into the bowl of a food processor. Pulse until the texture resembles soft serve ice cream, about 3 minutes. You may need to scrape the sides of the food processor with a rubber spatula occasionally. Serve immediately. Prep time does not include time to freeze bananas and strawberries. This is my favorite banana soft serve combo! I like to serve it up with a little chocolate sauce drizzled over top. 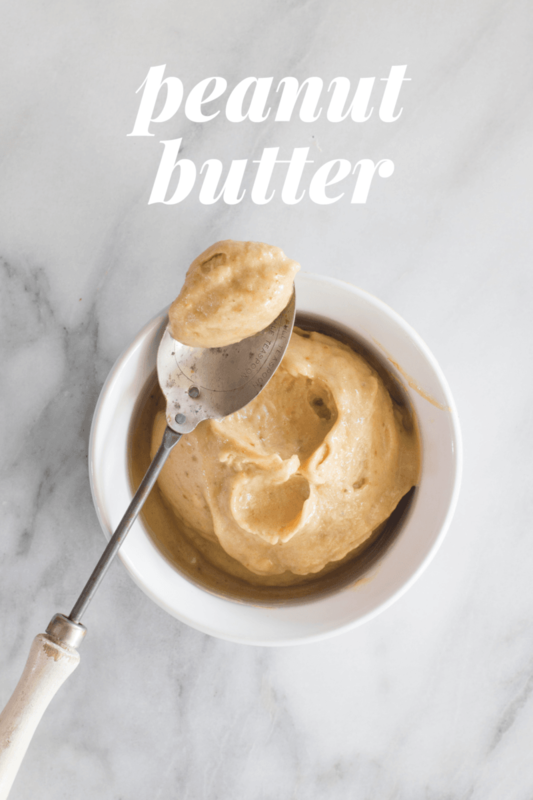 Sub in almond butter or sunflower butter for a fun alternative to peanut butter. 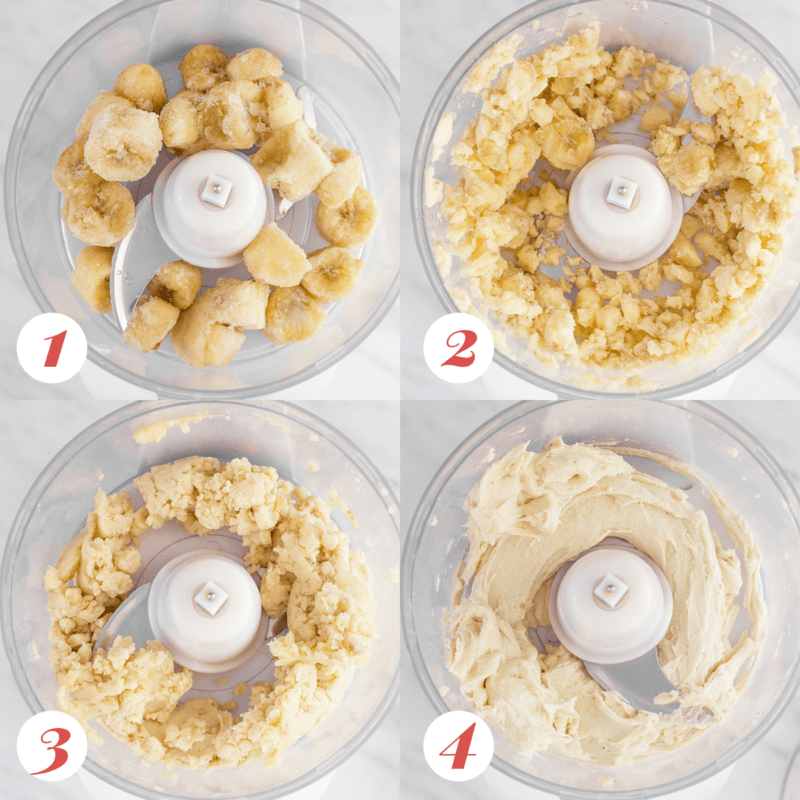 Place frozen banana slices, peanut butter, and salt into the bowl of a food processor. Pulse until the texture resembles soft serve ice cream, about 3 minutes. You may need to scrape the sides of the food processor with a rubber spatula occasionally. Serve immediately. 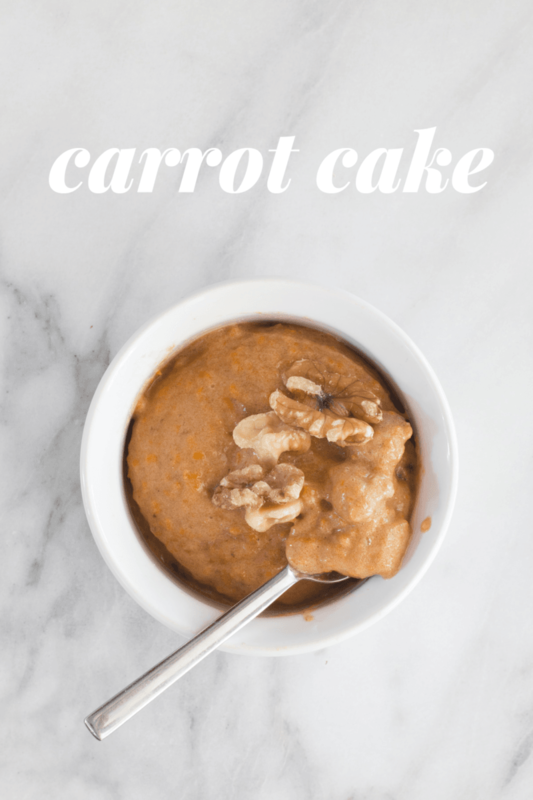 Love carrot cake but don’t love the way it makes you feel? 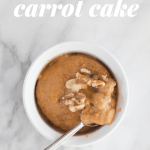 This carrot cake banana soft serve has the flavor of carrot cake and the nutrition of eating healthy fruit! This recipe uses Musselman’s Apple Butter to add spice cake flavor! Add in the apple butter, carrot, and vanilla, and pulse until just combined. Fold in the raisins and walnuts. Serve immediately, or freeze for 10-15 minutes to solidify. A healthy taste of the tropics! Frozen bananas are blended with pineapple and coconut milk (the full fat stuff in the can) to make a creamy, dreamy treat. 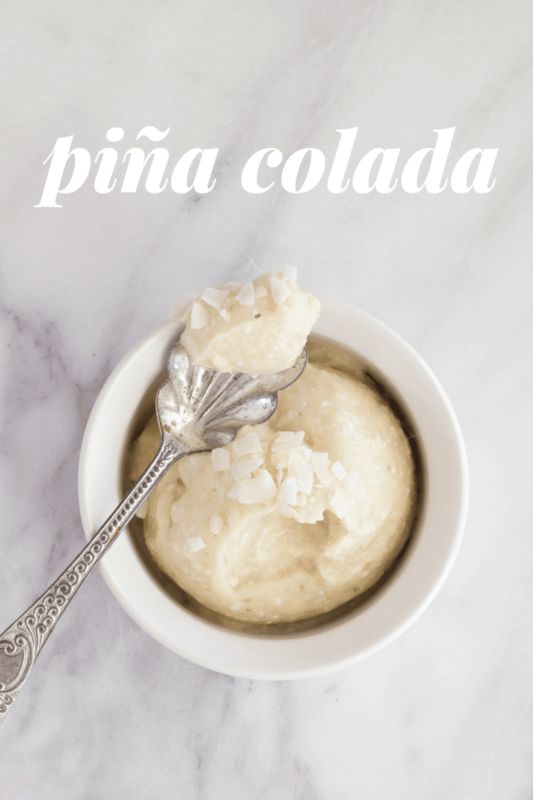 Add in the pineapple chunks, coconut milk, and coconut flakes, and pulse until just combined. Serve immediately, or freeze for 10-15 minutes to solidify. This post is sponsored by Musselman’s Apple Butter. Made with American-grown apples, Musselman’s Apple Butter is more than just a spread! Apple butter is a versatile ingredient that can enhance your favorite sweet and savory recipes. Learn more by visiting the Musselman’s Apple Butter website. on following them on Twitter, Facebook, or Pinterest. We have a less than ideal blender (actually, we use a NutriBullet) so we always add some unsweetened vanilla almond milk to ours to help blend. It still comes out pretty thick. And still super tasty! Peanut butter is my favorite too but I can’t wait to try these apple butter versions! Yay!! I’m excited to try these! Thank you!! Oh my gosh! These look great. Can’t wait to try them. Thank you. That definitely makes more sense. Last summer, at Costco, they were demonstrating a machine called a “Yonana.” I am NOT one to make any kind of impulse purchase but this came home that day and every day since I go to my freezer and remove the bananas and whatever other fruit I want that day. It is healthy, low fat and the taste is awesome! There are several new recipes in here and I can’t wait to give them a try! Thank you! They look delicious. I will definitely try most of the recipes. Love Banana Ice Cream! I have a 2 year old grand daughter and she is gonna love these recipes!! Thank you!! Tried the strawberry one and was delicious! Where did you get the spoons in the chocolate pic? Do you remember? They were from Crate and Barrel ages ago. It doesn’t look like they are listed on their website anymore. Sorry! Oh well, thanks for checking! 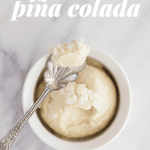 Hi and thanks for sharing, for some reason in the pina colada recipe it just says ‘cup of pineapple chunks’, ‘cup of coconut milk ‘ does that mean 1 cup of each? Sorry if it’s my mistake I tried to reload the page several times but it won’t appear. Cheers, looking forward to try this! Do these freeze well for extended storage? This is my new favorite sweet treat! My whole family is in love with all of these incredible flavors. Thank you for bringing the taste of ice cream back into our lives without the tummy aches and negative side affects of milk products in our tummies. We are buying bananas by the dozen and freezing them. ..Do you have just chocolate or strawberry recipes? Just wondering. Sorry, no – the banana is what makes it nice and creamy! Do you have any tips to stop the ice cream from going hard and icy in the freezer? I absolutely love it but find t hard to store. It is tricky to store. The best luck I’ve had is to store it in small scoops, and then reprocess it in the food processor or blender to get it smooth again when it’s time to eat.